Over the last year or so I’ve found myself reaching the point of just having to get up and go outside for a while. Saturday morning was the lastest incident, and was the culmination of a couple of day’s worth of planning to stretch the legs. 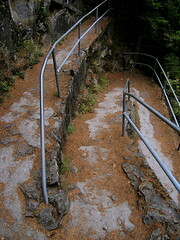 A few weeks prior, we’d driven out to Beacon Rock State Park as a family, just to scout it out. We didn’t get much farther than the bathroom at the parking lot as Camille had fallen asleep, but it was impressive enough for the boys to know they were looking up at the remains of an ancient volcano. There’s a quite a bit of climbing on the thing, but it’s the path up the southwest side that’s interesting (at least at this point in our Vancouver explorations…). Hopefully soon I can get out and up on the rock, but I haven’t run into any potential climbing partners yet, so we’ll see how that goes. In the meantime, I’ll still be escaping on Saturday mornings and trying to get some legwork in.